00:03:03 – Fare-thee-well to Paul! On this episode of the Comics Alternative’s Young Readers show, Gwen and Derek discuss summer 2018 new releases, all geared to middle-grade readers. The first text, edited and illustrated by Chad Sell, is The Cardboard Kingdom, released by Random House Graphic. Readers learn about the lives and dreams of a group of neighborhood kids in short stories written by Jay Fuller, David DeMeo, Katie Schenkel, Kris Moore, Molly Muldoon, Vid Alliger, Manuel Betancourt, Michael Cole, Cloud Jacobs, and Barbara Perez Marquez. The second text they discuss is Hope Larson’s All Summer Long from Farrar Straus Giroux. And finally, Gwen and Derek review Vera Brosgol’s long-awaited memoir, Be Prepared, released by First Second Books. They start by reviewing a comic that demonstrates the experimentation that is currently taking place in the young reader category: Chad Sell’s edited collection of connected short stories, The Cardboard Kingdom. Set in a suburban neighborhood and featuring a truly diverse and engaging group of young kids, these stories show how imagination can function as a coping device. Young reader short story collections are not entirely new. Random House has also supported the Comics Squad series, edited by Jennifer Holm and a rotating cast of co-editors, that have included themed volumes on “Recess,” “Lunch,” and “Detention.” However, this short story collection boast only one artist, Chad Sell, and is presented as a cohesive narrative, with authors identified only at the end of the text. As such, the comic has a more cohesive feel, rather than a collection of fundamentally different stories that are linked only by theme. After that, Gwen and Derek check out Hope Larson’s All Summer Long. This is the story of a 13-year-old, Bina, and her attempts to find meaning over the course of a summer. Growing up, she had been used to spending the summer with her best friend Austin, but during this particular summer, Austin goes off to soccer camp, leaving Bina to fend for herself. And part of this fending includes Austin’s aggressive older sister, Charlie. This is a book all about growing up and finding your way over the course of significant life changes. Finally, Gwen and Derek discuss Vera Brosgol’s Be Prepared. This memoir focuses on the summer between 4th and 5th grades, when she attends Russian summer camp in the hope of finding friends with whom she will have something in common. The opening vignette in the novel focuses on young Vera’s sense of cultural and economic isolation: as an immigrant from Russia and the daughter of a single mom living in a prosperous east coast suburb, she is often slow to pick up on the latest trends — such as American Girl dolls — and unable to approximate the lavish birthday parties that her classmates’ parents are able to throw for their children. At the end of the school year, Vera listens to the plans that her friends are making, attending girl scout camp, taking vacations to faraway destinations…and she feels left out again. However, at the Russian Orthodox church that she attends, Vera learns from Ksenya, a Sunday school friend, about Orra, a Russian heritage camp, and she is certain that it will not only be fun, but will give her something to talk about with her school friends in autumn. While the experience is certainly life changing, it nonetheless becomes something quite different than what Vera had expected. 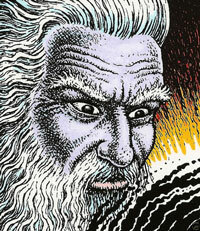 Perhaps one of the most puzzling comics releases in years was The Book of Genesis, Illustrated by R. Crumb. While it’s a virtuoso art performance, the exact purpose of the book was puzzling to Crumb fans (“It’s not a parody? !”) and religious readers (“This comic is not for kids? !”) alike. Both groups have been taken aback by how straight Crumb plays it — neither parodying nor bowdlerizing the work. Which is not to say that nothing in it is Crumb’s own interpretation. Tim and John discuss the issues raised — both by Crumb and by his audience.